When you import and manufacture some of the most innovative parts in the industry, finding the right bike o showcase them on can be a challenge. 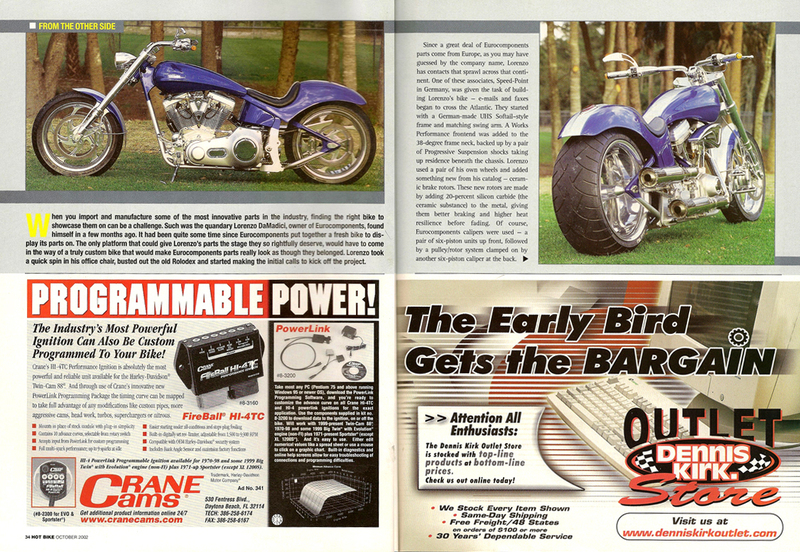 Such was the quandary Lorenzo DaMadice, owner of Eurocomponents, found himself a few months ago. It had been quite some time since Eurocomponents put together a fresh bike to display its parts on. The only platform that could give Lorenzo’s parts the stage they so rightfully deserve, would have to come in the way of a truly custom bike that would make Eurocomponents parts really look as though they belonged. Lorenzo took a quick spin in his office chair, busted out the old Rolodex and started making the initial calls to kick off the project. Since a great deal of Eurocomponents parts come from Europe, as you may have guessed by the company name, Lorenzo has contacts that sprawl across that continent. One of these associates, Speed-Point in Germany, was given the task of building Lorenzo’s bike – e-mails and faxes began to cross the Atlantic. 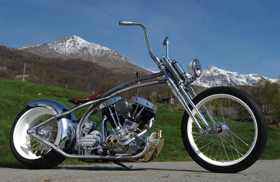 They started with a German-made UHS Softail-style frame and matching swing arm. 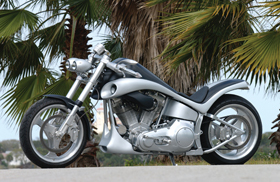 A Works Performance frontend was added to the 38-degree frame neck, backed up by a pair of Progressive Suspension shocks taking up residence beneath the chassis. Lorenzo used a pair of his own wheels and added something new from his catalog – ceramic brake rotors. These new rotors are made by adding 20-percent silicon carbide (the ceramic substance) to the metal, giving them better braking and higher heat resilience before fading. Of course, Eurocomponents calipers were used – a pair of six-piston units up front, followed by a pulley/rotor system clamped on by another six-piston caliper at the back. Lorenzo insisted the bike should have more than an ample amount of power, but he wanted to make it easy on the crew at Speed-Point. The solution was to order a complete 113-inch Evo kit from S&S that included everything necessary, short of the Crane HI-4 ignition that sparks it off. 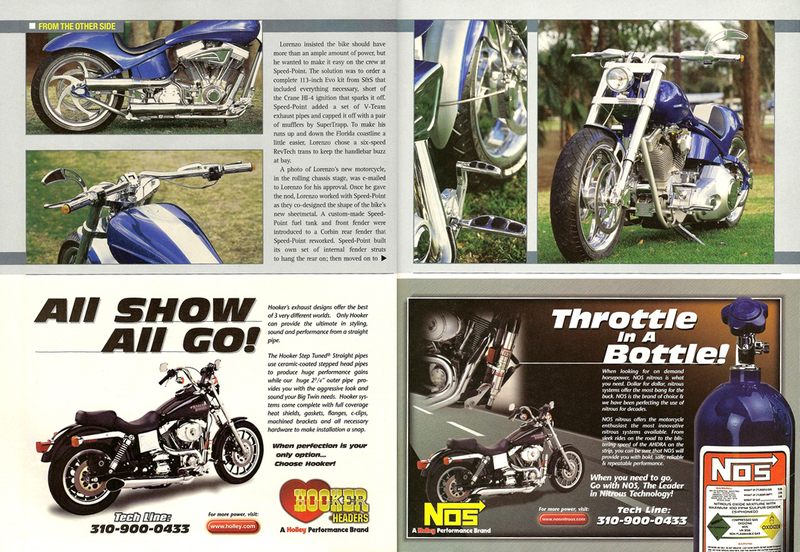 Speed-Point added a set of V-Team exhaust pipes and capped it off with a pair of mufflers by SuperTrapp. To make his runs up and down the Florida coastline a little easier, Lorenzo chose a six-speed RevTech trans to keep the handlebar buzz at bay. 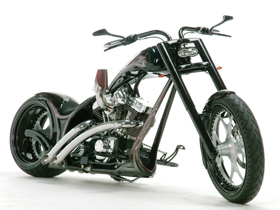 A photo of Lorenzo’s new motorcycle, in the rolling chassis stage, was e-mailed to Lorenzo for his approval. Once he gave the nod, Lorenzo worked with Speed-Point as they co-designed the shape of the bike’s new sheetmetal. 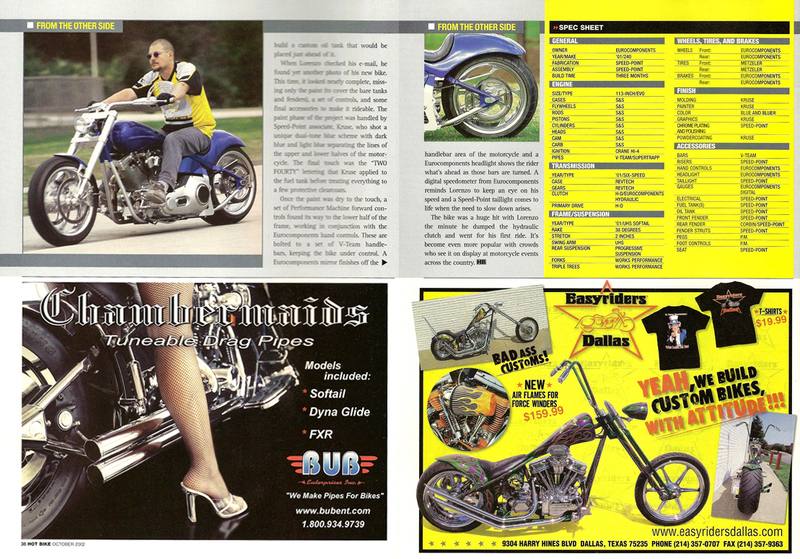 A custom-made Speed-Point fuel tank and front fender were introduced to a Corbin rear fender that Speed-Point reworked. Speed-Point built its own set of internal fender struts to hand the rear on; then moved on to build a custom oil tank that would be placed just ahead of it. When Lorenzo checked his e-mail, he found yet another photo of his new bike. This time, it looked nearly complete, missing only the paint (to cover the bare tanks and fenders), a set of controls, and some final accessories to make it rideable. 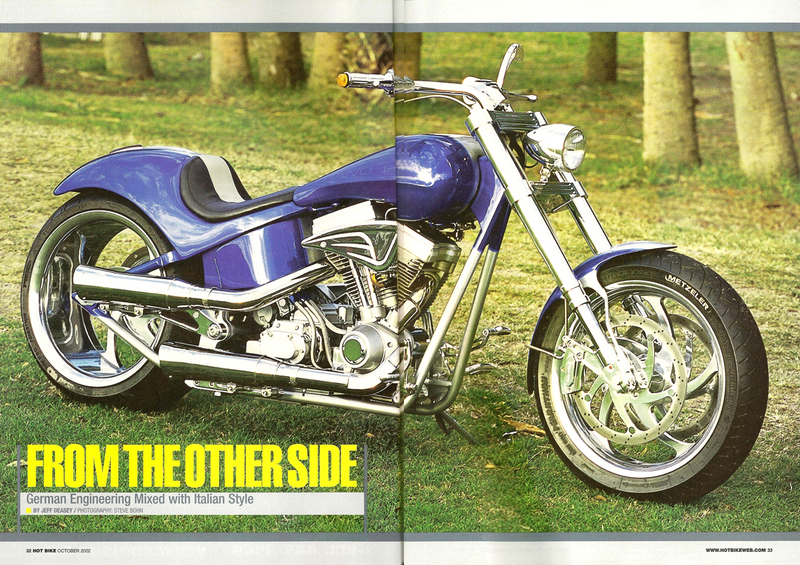 The paint phase of the project was handled by Speed-Point associate, Kruse, who shot a unique dual-tone blue scheme with dark blue and light blue separating the lines of the upper and lower halves of the motorcycle. The final touch was the “TWO FOURTY” lettering that Kruse applied to the fuel tank before treating everything to a few protective clearcoats. Once the paint was dry to the touch, a set of Performance Machine forward controls found its way to the lower half of the frame, working in conjunction with the Eurocomponents hand controls. These are bolted to a set of V-Team handlebars, keeping the bike under control. 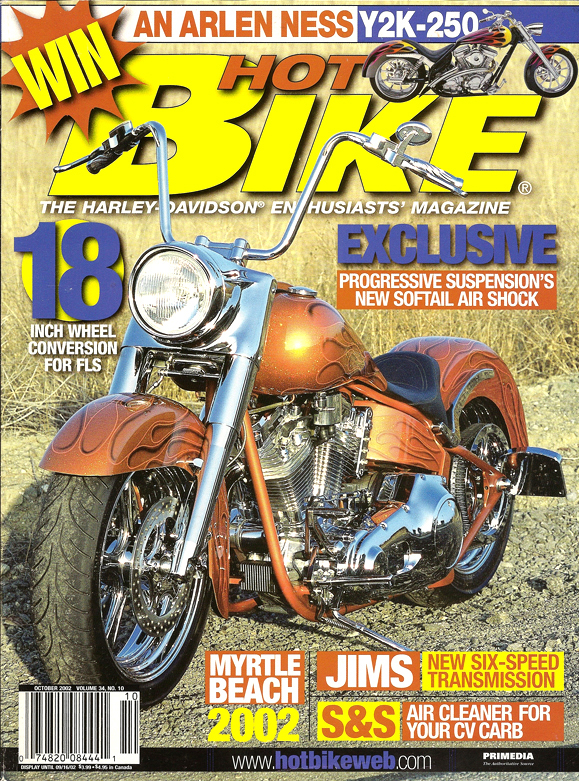 A Eurocomponents mirror finishes off the handlebar area of the motorcycle and a Eurocomponents headlight shows the rider what’s ahead as those bars are turned. A digital speedometer from Eurocomponents reminds Lorenzo to keep an eye on his speed and a Speed-Point taillight comes to life when the need to slow down arises. The bike was a huge hit with Lorenzo the minute he dumped the hydraulic clutch and went for his first ride. It’s become even more popular with crowds who see it on display at motorcycle events across the country.